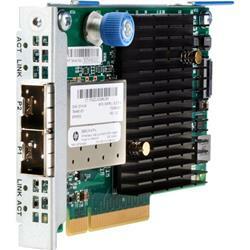 Do you need a high-performance 10 Gb Ethernet adapter for your HP ProLiant Gen9 server family? The HP FlexFabric 10Gb 2-port 556FLR-SFP+ Adapter is installed in the FlexibleLOM socket in the ProLiant Gen9 Rack/Tower servers. The adapter offers 10 GbE FlexibleLOM with RDMA and Tunnel Offload features. It provides full-featured, high-performance, converged 10 Gb Ethernet that accelerates IT services and increases data center efficiency. Tunnel Offload provides efficient overlay networking to increase VM migration flexibility and network scale with minimal impact to performance. Traditional layer 2 networks limit mobility and scale of virtualized and multi-tenant workloads.